Could this be a listerine bottle shard? 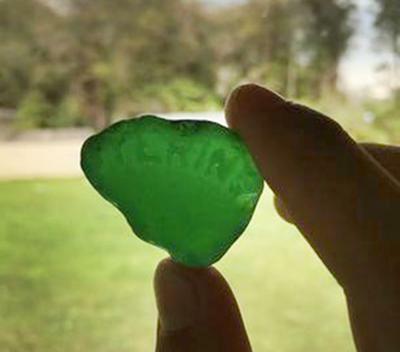 My question for you today is regarding this picture of a piece of sea glass found in Hilo on the beach of an old Sugar Mill. Looks like it could have been an old Listerine bottle (“STERINE”?). 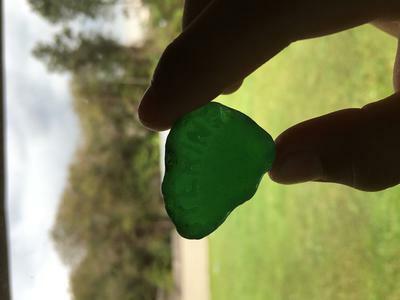 Can anybody help identify this beautiful piece of beach glass? Comments for Any guesses??? Listerine? Pretty sure it's from an old Glycerin bottle! I googled and found an old green Glycerin bottle! I bet that's what it is! It does look like "Listerine." However, all the LISTERINE bottles we have seen do not have the letters in a curved arc - they are usually block letters straight across. We are eager to see what others might have to say.